Two Tour de France stage winners have tested positive for an advanced blood doping product. Italy's Leonardo Piepoli and Germany's Stefan Schumacher tested positive for Continuous Erythropoiesis Receptor Activator (Cera). 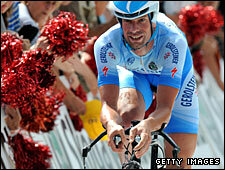 Italy's Riccardo Ricco has already admitted to using Cera, a version of the blood booster erythropoietin (EPO). Between them the three riders won five stages during the July race - or about a quarter of the 21 stages. The French Anti-Doping Agency has been retesting blood samples from the race in a bid to catch more cyclists they suspect may have used Cera. The German cycling federation (BDR) is set to take disciplinary action against Schumacher following his positive test and he could face a two-year ban. "It is a shock, but it is also good news," said BDR president Rudolf Scharping. "The ever tighter net of the anti-doping investigators is making sure that practically no-one is getting through anymore."